Skype offers Free 30 Minutes on EID : Promotional Offer | Free Pc to Phone Calls, Free Voip Calls to India International ! First of all wish all our blog readers a very happy EID. The festive season is around and its time voip companies have started offering free calls. Skype, one of the voip industry leaders has announced its new offer so that everyone can wish their relative and friends on the occasion of EID. If you've never tried using Skype to call a landline phone or mobile, now's your chance to discover what else Skype can do. Skype is offering 1 million free voucher giveaway so that can call around the world for up to 30 minutes. 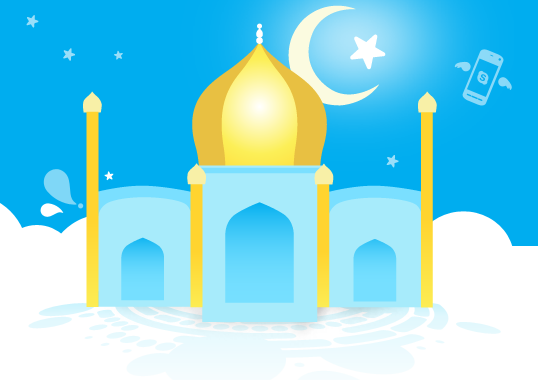 This way Celebrate Eid with free calls to friends and family all over the world from Skype. Getting this free voucher is very easy, but to bring to your notice - these vouchers are limited in number so you should probably not wait and grab your voucher now. The buzz about this free voucher giveaway is already spreading and soon these vouchers will be finished. Enter your email address and wait for the confirmation. Skype will then email you a special code to claim your free Skype Credit so you can start sending Eid wishes. - Offer subject to availability, limited to one million vouchers in total. Only one voucher per email address. - Skype reserves the right to exclude participants from the offer in the event of suspected abuse or fraud. - To redeem your voucher and make Skype calls, you must have a registered Skype Name and an internet connection. - The Skype Credit will be applied to your Skype account. 30 total minutes is based on a single call to a landline at the rate of €0.02 per minute. - The actual number of minutes you can redeem with this offer may vary based on your calling destination and whether you call landline or mobile phones. - A connection fee applies. - Redeem your voucher by 31.03.11. It is damn easy to use Skype. You can either use it on your computer, tablet or mobile phone (iPhone/iPad/Windows Mobile). Apart from using these free minutes you can use Skype for free calling (Skype to Skype voice and video calling) and text messaging. Skype is going to take its own time to send out the vouchers. Please be patient after you register as you might not get the voucher instantly.